This is case number 69605.22, which contains 16 figures and may contain: 2 Dengar, 2 4-LOM, 2 Admiral Ackbar, 2 ASP-7, 2 Bib Fortuna, 2 Bossk, 2 Jawa Two-pack, and 2 2-1B Medical Droid. 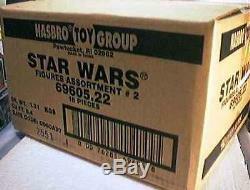 This case was released by Kenner Hasbro Toys from June 1997 - August 1997. The case assortment is not guaranteed as it is a factory sealed case and we do not know exactly what is in it and the information presented here is based on past case pulls and information obtained from Kenner. There is no guarantee as to the condition of the figures inside the case, but the case appears to be fine from the outside. Add Me to Your Favorite Sellers. Search For Items At American Icons Collectibles Search titles and descriptions. The item "Star Wars Hasbro Action Figure Case 69605.22 Factory Sealed New 1997 Ackbar Jawa" is in sale since Friday, October 12, 2012. This item is in the category "Toys & Hobbies\Action Figures\TV, Movie & Video Games". The seller is "amricons" and is located in West Sacramento, CA.